I am using a photo taken in Patuet, South Sudan, when I went several years ago. 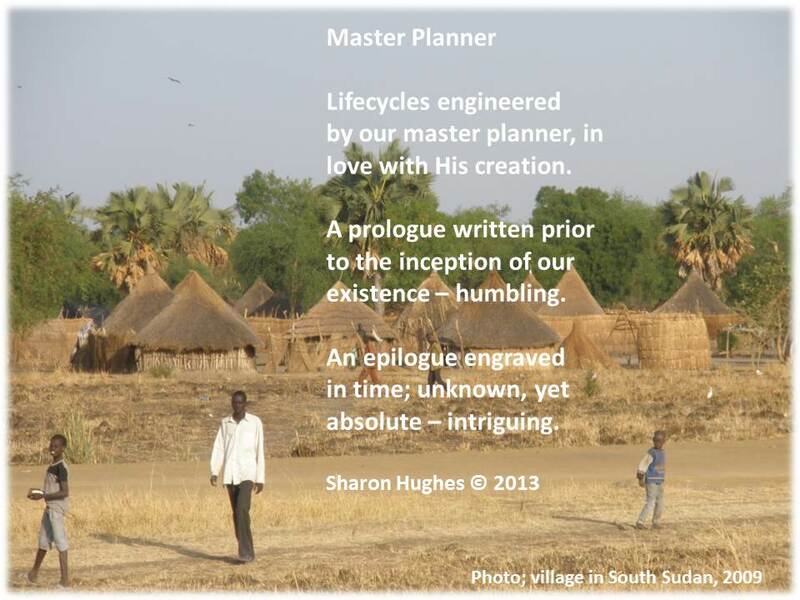 I have this photo and several others on my ‘Building Hope in Southern Sudan’ page. I love this photograph; this fellow is a typical working man, a shepherd. The shepherds walk their goats, sheep and cattle to the White Nile River to water and graze them. This is not unusual, except that Patuet is at least a two day walk to the river. A road now runs through Patuet. The medical center come school we built has brought a lot more foot traffic to the village. There is also a trading place there now, where people can sell and trade their goods. 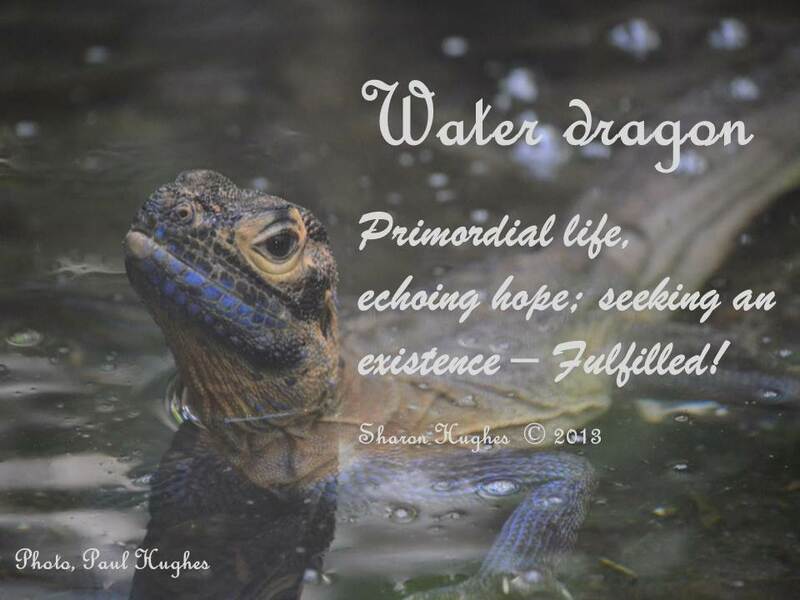 I have written a poem to connect with this photo. 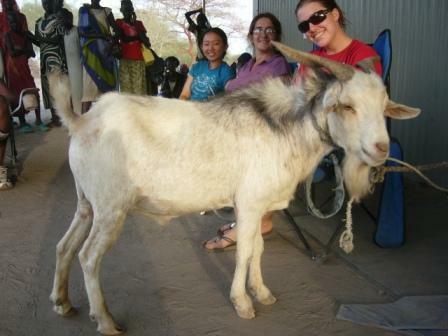 I will also add another photo I love, of a goat that the chief gifted to us for going and helping out with a medical team in 2009. We found it rather difficult to explain that we could not take the goat on the plane with us back to Australia. One of the great doctors, and a great nurse are in this photo with me, taking care of the goat, before we had to give it to someone else to take care of it for us. This gift was incredibly generous, as this goat was breeding stock, and worth a lot of money to these people, who live very humbly, and need every resource they have to survive. As followers know, I have been to South Sudan a couple of times to do some work in a lovely village called Patuet. I took this lovely photo of a sunset, typically African. Sadly the trip we were supposed to be going on in April this year was cancelled for agriculture work, as we couldn’t get enough funding for the project to go ahead, so hoping that next year this will be another story. Fortunately the medical team got to go, and did a great job, as usual. 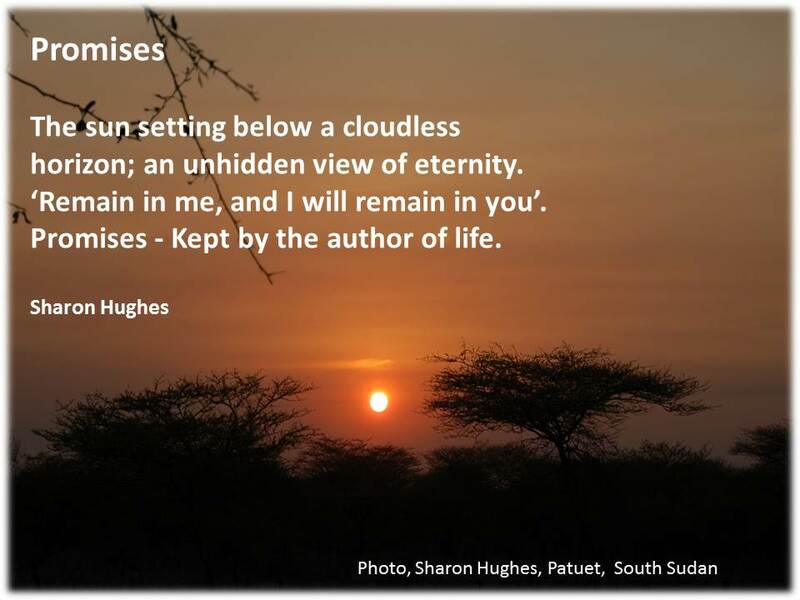 I attached this poem I wrote to the photograph I took of the beautiful sunset in Patuet. 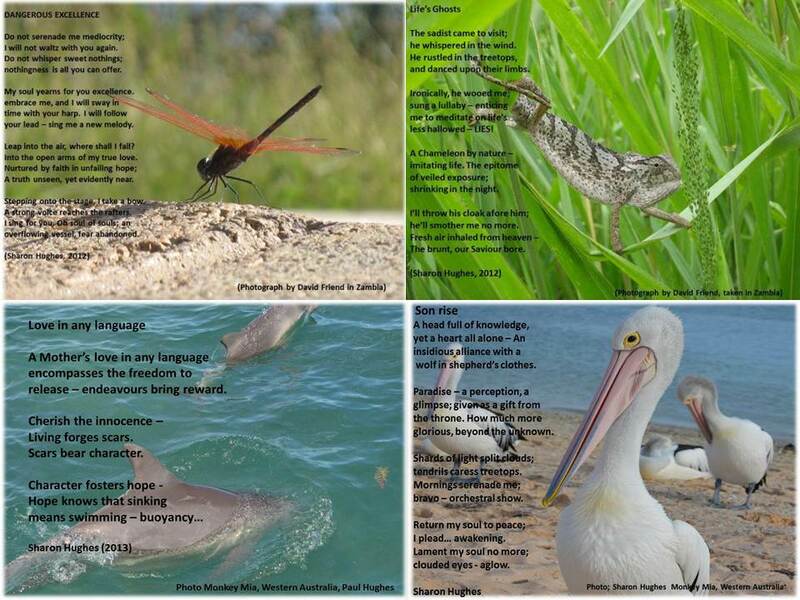 Lovely memories…. 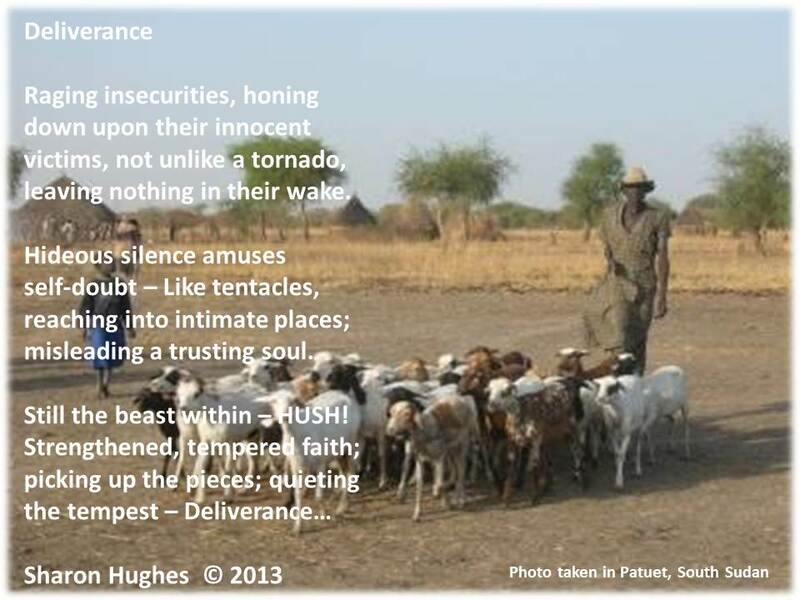 I connected this haiku I wrote to a photo that was taken on the 2009 trip we made to Patuet, in South Sudan. I don’t know who in our team took this photo. It could have been either Dr Ian Everitt or photographer extraordinaire, Bena Wandei. 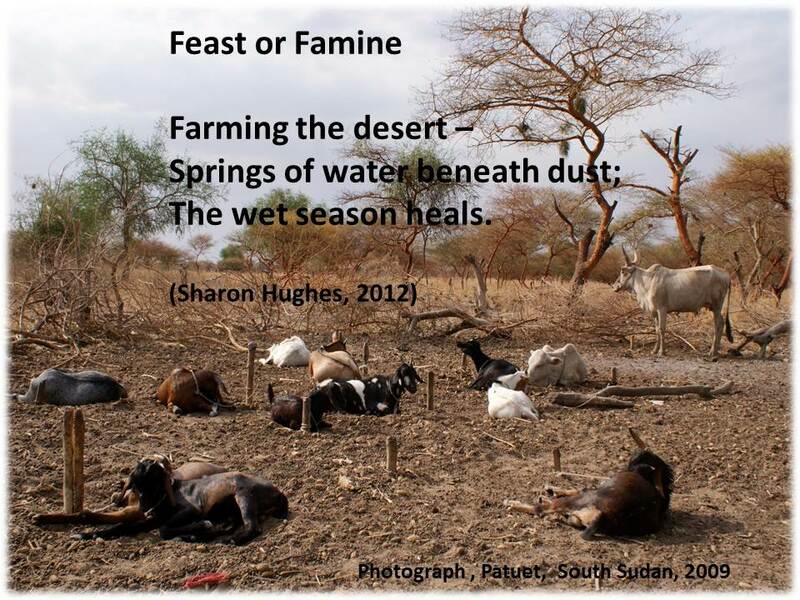 I love the way the photograph depicts the livestock farming in the tropical wet and dry climate of South Sudan. Temperatures are high throughout the year, with a dry season from November to March and a wet season from April to October. The wet season arouses the earth, the country side becomes alive; yet the water and the earth are quickly dried up with the onset of the somewhat shorter dry season. South Sudan’s major water resources are the Nile (White and Blue Nile) and its tributaries, and aquifers. A large part of South Sudan is covered by wetlands at favourable times of the year. We were in Patuet in late February, the hottest and driest time of the year. The shepherds still herd their goats, sheep and cattle; nothing much grows this time of year, fresh fruit and vegetables are non-existent. The well is the only local water available, the water tank dries up quickly. The hot, dry conditions trigger seasonal human and livestock migration to more permanent water sources (the toic), which serve as dry season grazing pasture, and for some ethnic groups, such as the Dinka, they also serve as fishing grounds. The people living in Patuet are of the Nuer tribe, they are predominantly cattle herders. 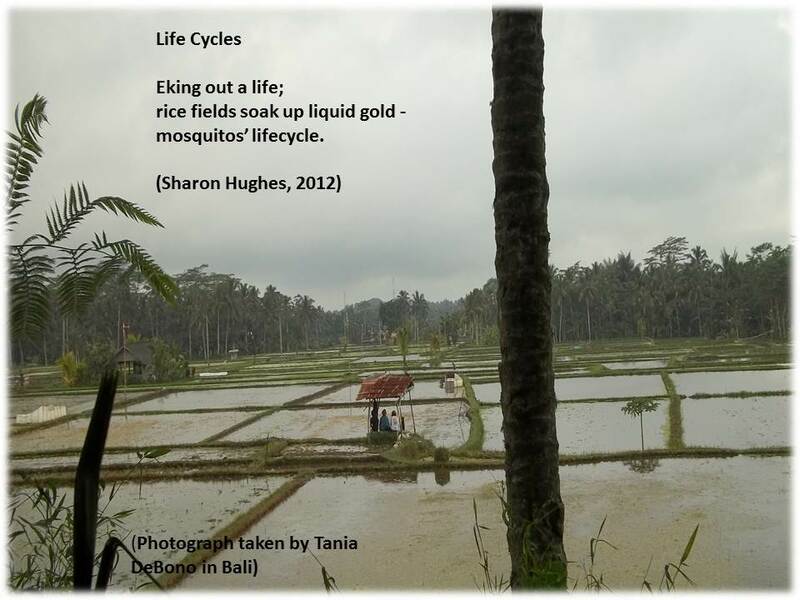 Here is my haiku and the beautiful photo my sister took of a Rice field in Bali. I love agricultural science (as those who often read my blog know); so I have a bit of an affinity with this photo. It is that time of year…. My weeping mulberry tree (Morus alba ‘Pendula’) is in leaf, and fruiting prolifically! Hooray! We have been looking forward to purple stained fingers (purple is my favourite colour), and sharing our delicious fruit with the local birds. Unfortunately, there is so much fruit this year, that even sharing it with the birds and the rest of my clan has not stopped wastage (losing our beloved fruit to the earth). We have so much fruit, that much of it has fallen from the tree and hit the dirt! I love my garden; this is why I am chapping at the bit to get my aquaponics system going. But many distractions (work, family, life) have been limiting our progress (I am very apt at making up excuses and procrastinating). Can I come up with anymore distractions??? How about…. Christmas is on our doorstep, only 6 weeks to go! UH OH!!! I need the back garden to be set up for our extended family to come for the annual Christmas party! OUCH, we will have to get it set up before then! Uh well, I have diverged from my weeping mulberry tree banter! The mulberry tree is a member of the moraceae family, which is native to China. In herbal medicine, the fruit, leaves, flowers, stems, bark and roots are used to treat a number of conditions. Delicious, fleshy, succulent mulberries are low in calories (just 43 cal per 100 g); but are a rich source of many health promoting plant derived compounds, minerals and vitamins that are essential for optimum health. The berries contain resveratrol, another polyphenol flavonoid antioxidant. Resveratrol has been found to be protective against stroke risk by alteration of molecular mechanisms in blood vessels, reducing susceptibility to vascular damage through decreased activity of angiotensin (a systemic hormone causing blood vessel constriction that would elevate blood pressure) and increased production of the vasodilator hormone, nitric oxide. In addition, these berries are an excellent source of vitamin-C (36.4 mcg per 100, about 61% of RDI), which is also a powerful natural antioxidant. Consumption of foods rich in vitamin-C helps the body develop resistance against infectious agents, counter inflammation and scavenge harmful free radicals. They also contain a good amount of vitamin A, vitamin E and in addition to the above mentioned antioxidants also contain many other health promoting flavonoid poly phenolic antioxidants such as lutein, zeaxanthin, ß-carotene and α-carotene in small but notably significant amounts. These compounds help to protect the body from harmful effects of oxygen-derived free radicals and reactive oxygen species (ROS) that play a role in aging and various disease process. Zeaxanthin, an important dietary carotenoid selectively absorbed into the retinal macula lutea, where it is thought to provide antioxidant and protective light-filtering functions in the retina of eyes. Mulberries are an excellent source of iron, which is a rare feature among berries, contains 1.85 mg/100 g of fruits (about 23% of RDI). Iron, being a component of hemoglobin inside the red blood cells, determines the oxygen carrying capacity of the blood. They are also a good source of minerals like potassium, manganese, and magnesium. Potassium in an important component of cell and body fluids that helps to control heart rate and blood pressure. Manganese is used by the body as a co-factor for the antioxidant enzyme superoxide dismutase. They are rich in the B-complex group of vitamins and vitamin K; containing very good amounts of vitamin B-6, niacin, riboflavin and folic acid. These vitamins function as co-factors and help the body in the metabolism of carbohydrates, proteins and fats. Below are some photos of me and our Mulberry Tree, kindly placed in our front garden for anyone to enjoy (birds, neighbours and family members). Yacouba Sawadogo, a peasant farmer from Burkina Faso, is known as the “man who stopped the desert.” But when he first tried to save his arid land from desertification by planting the trees that have since grown into a 15-hectare forest, people in his village thought he was mad. Some 30 years later the people of Gourga, in northwestern Burkina Faso, who left the infertile area for a better life in the city, are returning while Sawadogo travels the world sharing his success story. Farmers, environmental experts and scientists are also flocking to Sawadogo’s home to learn about the man who singlehandedly stopped the desert. Sawadogo’s story also attracted film director Mark Dodd who produced an award-winning film titled “The Man who Stopped the Desert”, which was showcased at the 10th session of the United Nations Convention to Combat Desertification (UNCCD) Congress of Parties (COP 10) currently being held in Changwon, South Korea. But Sawadogo had not started out trying to save the land from desertification. Thirty years ago he was merely looking for a way to harvest his crop in an area where the land had become barren and many were giving up farming and migrating to urban areas. “There was no food because of the drought and water was very scarce in my community,” the elderly, polygamous farmer told delegates at the UNCCD. Sawadogo then realised that it was no longer sufficient to dig ordinary holes to plant his crop, so he decided to dig bigger and wider holes in order to retain rainwater for a longer period. He also used compost to enhance the growth of the sesame seeds and cereals – sorghum and millet – that he grew. “The traditional farming method used in my village allowed the rainwater to be easily washed away leaving the crops to dry up within a short space of time. That’s why I thought of a technique that would counter this problem,” said Sawadogo. He was not only worried about food security but was concerned that the land in Gourga was rapidly turning into a desert. So he began planting trees. It not only saved the land from degradation but also restored ground water to unprecedented levels. The trees, which he planted with the help of his family, are a thick forest of 15 hectares made up of indigenous plants, some of which are used for medicinal purposes. He now gives away seeds for planting to farmers in Burkina Faso and in the Sahel, an ecoclimatic zone 1,000 kilometres wide that stretches from the Atlantic Ocean to the Red Sea. The facilitator of Africa’s Re-greening Initiatives at the Centre for International Cooperation, Chris Reij, said experts have a lot to learn from Sawadogo. Dorcas Kaiser, a termite specialist, has been to Gourga to learn from the smallholder farmer about the role the insects play in land restoration. “(It) is a scientist’s dream place to study the role of termites in the land restoration process,” said Kaiser. World experts have debated land restoration, and masses of money has been spent trying to find solutions to desertification, land degradation and droughts, but so far these efforts have been fruitless, said Reij. “It took a smallholder farmer to come up with a system that works where global agencies have failed,” said Reij. UNCCD Executive Secretary Luc Gnacadja also noted the role farmers play in re-greening Africa during the COP 10 opening ceremony on Oct. 17. Gnacadja said that planting trees, and using fertiliser on farmlands and grazing lands has already been adopted in many regions and has contributed to improving over six million hectares across Africa. “These good practices should be scaled up and governments should encourage them everywhere when relevant,” he said. Senior environment specialist cluster coordinator for sustainable land management at the Global Environment Facility (GEF), Dr Mohamed Bakarr, agreed and added that indigenous people like Sawadogo do not need a lot of money to make a difference. “Policies that say you can’t own trees or you can’t have land tenure make people neglect these resources,” said Bakarr. GEF is helping governments in Africa remove these barriers in order to create an enabling environment for people to become involved in combating desertification and creating food security. However, despite saving Gourga from becoming a desert, Sawadogo may end up losing both his land and his forest. The Burkina Faso government is in the process of repossessing Sawadogo’s land for development. He acquired the land through the traditional system and does not have a title deed, and the government has already started with their construction plans. In the new land plan the government claims ownership of Sawadogo’s forest and fields and divides his father’s grave into two. Seeing his father’s grave being split to give way for the construction of a house kills him as much as the idea of letting go of his forest does, Sawadogo said. The only way Sawadogo can retain his land is if he buys it back from government. It is an option that he feels is both unfair and unaffordable. Sawadogo would need 100,000 Euros to buy back the forest alone. He has been to the United States where he pled his case to President Barrack Obama and asked him to consider the plight of smallholder farmers in the G8’s Global Food Security Initiative for underdeveloped countries. The initiative was a pledge by the G8 to boost world food security. “What Yacouba has started has to be preserved,” said Reij, who is working closely with the farmer. Gnacadja reminded delegates that if desertification, land degradation and drought occur unabated, the world would continue witnessing political instability and famine, like the one occurring in the Horn of Africa.